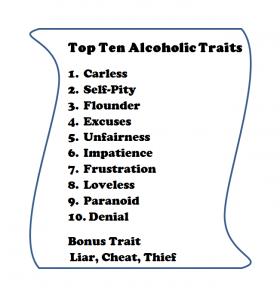 Writing of alcoholics, I wanted to provide what I believe to be their Top Ten Traits. I would love to hear back from you, about your ideas and any traits you think should also be on the list. Careless: Like a child, act without thinking. I want it now despite the consequences. Flounder: Generally, do not do as well as their skills allow, they give up. Unfairness: Everybody is against them and nothings fair. “wah wah wah life’s not fair”. Patience: Too difficult to cope with negative feelings/situations for any period of time. Paranoid: Everyone is out to get them – They feel they are being followed and watched. Bonus Trait – This trait is so well known, it is simply a given. It should be a list of its own. Liars, Cheats and Thief’s: They will make any excuse, tell any lie, cheat anyone and steal from everyone possible; especially their family, in order to drink. I’m curious how “liar” only made the bonus list? I would think that would be at the top of the main list. 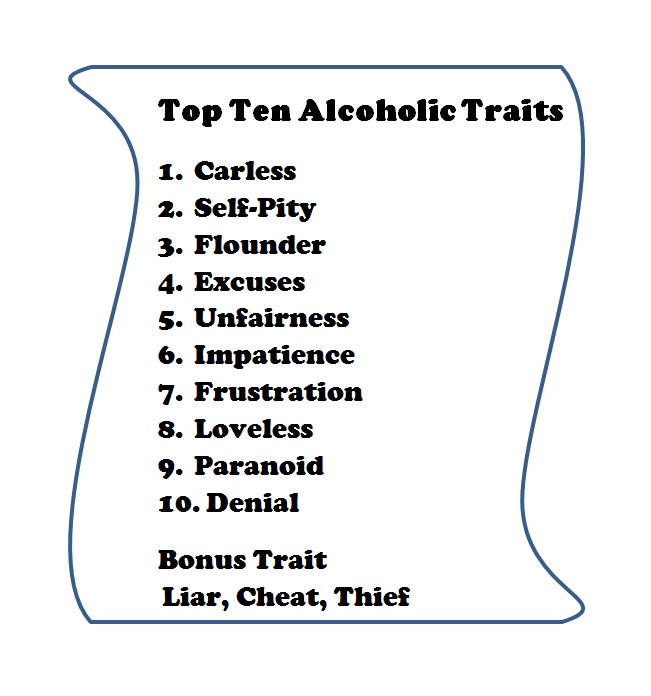 Where all 10 traits don’t fit all alcoholics, liar does. Whether it be to loved ones, people you don’t like, or yourself we all lie. Alcoholics are definitely LIARS. I list it as a Bonus, but also say that “it is so well known, it could be a list of its own”. Perhaps I should have led the blog with Liar at the top? Either way, we agree that alcoholics are liars, and will say or do anything for the next drink.